It’s been said that we spend the first half of our lives acquiring things and the second half getting rid of them. Unless I live to be 126, I’ve already passed the halfway point. As I strive for more order and less stuff in my life, I’m constantly on the lookout for possessions I no longer need or want. This is hard when it comes to items that belonged to my mother. I have her set of eight etched glass luncheon plates. I’ve never once used them. And yet there they are, taking up space in the display cabinet in my kitchen. I don’t wear dangly earrings, so the pair of pearl earrings she left me nestles in my jewelry box, taking up space. Ditto for a box filled with photos of people I don’t recognize and likely never knew. I hold onto these things because I can’t yet bear to get rid of them. But someday I probably will. There are other of Mother’s things I’ll keep forever and always. First and foremost is anything in her handwriting, which was a true work of art. I have her special recipes. Travel journals. Letters she wrote me when I married and when I gave birth to each of my babies. If those who predict that the generations behind me won’t be able to read cursive are correct, my descendants may not be able to read the things Mother wrote. But I treasure them. I’ll keep the classic Little Golden Books that Mother read to my siblings and me over and over and over again. Little Red Hen. Tawny Scrawny Lion. Poky Little Puppy. Saggy Baggy Elephant. Scuffy the Tugboat. And Little Black Sambo, now considered politically incorrect (but that’s a subject for another column). I read these books to my own children way back when. Now, with abundant joy, I read them to my grandchildren. Last but not least is an item most people wouldn’t glance at a second time, let alone treasure. 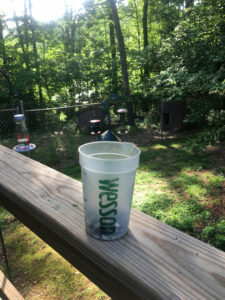 It’s a two-cup plastic beaker with the word “Wesson” stamped on the side. I assume it was designed to measure and pour vegetable oil, but Mother eventually used it for something much more important. She kept it inside a galvanized steel garbage can filled with birdseed. The beaker’s spout made it easy to pour seed into feeders of any shape or size, something Mother did every day until cancer robbed her of the strength to even do that. I’m not with any of my kids and grandkids on this Mother’s Day, but the Little Red Hen and I plan to Facetime them. After that, I just might whip up one of Mother’s special recipes or maybe settle in to read again about the trip she took to Ireland not long before she died. But it’s for sure I’ll fill my birdfeeders with the Wesson beaker. And I’ll think of my mother with love and gratitude.